Some say I exaggerate. I don’t think so. I just think if heaven does exist, and should I go there, then I would like there to be little snack tables all around with items like these on them. They are sweet and salty all at once, made from raw, nutrient dense foods, they pack a serious punch of protein and healthy fats, and are perfect for dairy-free, gluten-free, refined sugar-free devotees. But mainly they’re just delicious. 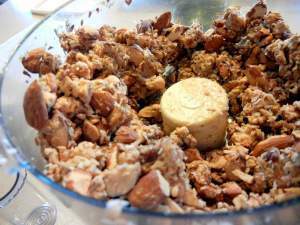 Pulse nuts, flaxseed, coconut, nut butter and salt in a food processor until coarsely ground. Add melted coconut oil to food processor along with remaining ingredients. Pulse to create a coarse and pasty mixture. Press mixture into an 8 x 8 glass baking dish. Chill in refrigerator for 1 hour, until mixture hardens. Cut into mini bars and store in refrigerator. Do NOT eat all at once. You will be fueled for a marathon.